Post-infection irritable bowel syndrome (PI-IBS) is a common condition that occurs instantaneously in around every 1 in 10 individuals, caused mainly by acute, infectious gastroenteritis. PI-IBS commonly affects females and young individuals with a prevalence of between 4 to 36%, and in Western countries, the prevalence is between 7 to 16%. It is a multifactorial complex disorder. It involves the interaction between the central and peripheral factors. Peripheral factors consist of elements such as microbiota, epithelial, enteroendocrine, immunologic, and neuromotor mechanisms. No current pathophysiological mechanism exceptional to PI-IBS is yet known. Gut dysmotility and visceral hypersensitivity are essential factors in the pathophysiology of PI-IBS, but bowel physiology has only been evaluated by a few studies. The individual-specific microbiota signature which has been preserved over 10 years even after broad-spectrum antibiotics shows the potential of gut microbiota to resist environmental perturbation and preserving its structure and function. Even after healing from an intestinal infection, ecosystem resilience is once again restored. The lactulose-mannitol excretion ratio demonstrates that in vivo permeability clearly increases in a portion of PI-IBS patients. Low-grade immune activation leads to increased intestinal permeability in the early stages. In IBS and PI-IBS patients, many studies have shown the presence of low-grade intestinal immune activation even though a condition of physiologic inflammation is regarded as normal. In the intestinal mucosa of PI-IBS patients, the innate immune system which consists of mast cells and macrophages have been found to be changed. In many gut functions, especially the motility and sensory perception, the key regulators seen are EC cells of which 5-HT (5-hydroxytryptamine or serotonin) is recognized as a key signalling molecule. Functional gene variants and their associations with the PI-IBS phenotype have been examined by the Walkerton outbreak cohort. Researchers found that besides PI-IBS clinical risk factors, 4 independent variants, 2 in toll-like receptor (pattern recognition receptor) and one each in IL-6 (proinflammatory cytokine) and CDH1 (tight junction protein) were associated with PI-IBS. The occurrence of enteritis based on specific demographic, psychological, and clinical factors is known to be associated with PI-IBS risk. 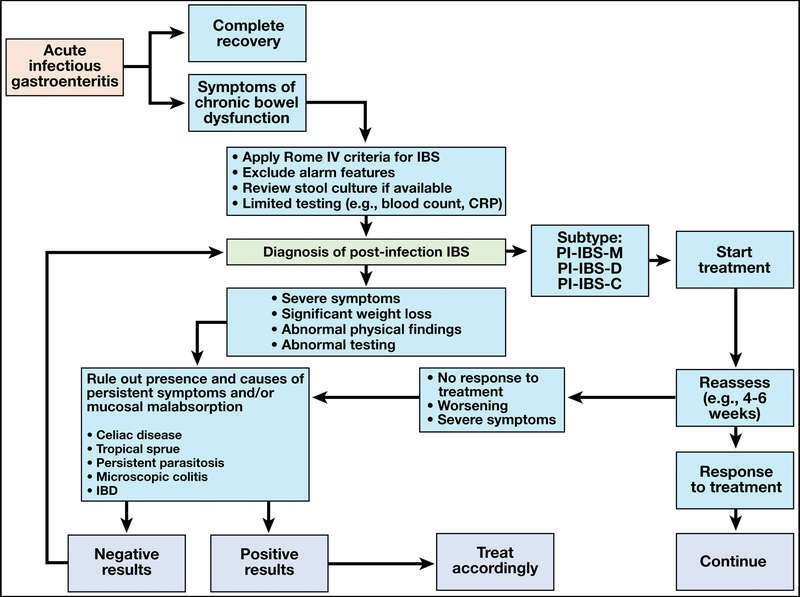 The Rome Foundation Working Team (RFWT) proposed the diagnostic criteria for PI-IBS on the basis of Rome IV criteria. A stool culture is the ideal diagnostic test for acute infectious gastroenteritis which can be confirmed by molecular biology analyses, or by the presence of any two of these symptoms or signs of fever, vomiting or diarrhoea. Note: A recollection of the precise date of onset of IBS symptoms can also be suggestive of PI-IBS. Note: Some patients may experience irregular bowel movements before the onset of acute illness (but not associated with the frequent pain characteristic of IBS) that can still be defined as developing PI-IBS. Physicians can make a diagnosis without any additional significant diagnostic assessment in typical cases of PI-IBS without alarm features such as bleeding, anaemia, early satiety, unexplained weight loss, progressive dysphagia or odynophagia, recurrent vomiting, and family history of gastrointestinal (GI) cancer). In order to rule out chronic parasitic or protozoal infections, some patients can undergo faecal tests. 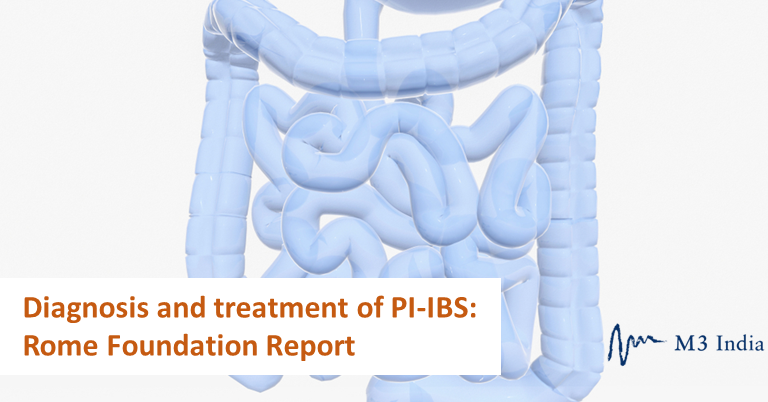 The RFWT (Rome Foundation Working Team) performed systemic literature and found that there are no current guidelines or recommendations for managing PI-IBS. Delphi process was adopted by the RFWT regarding the condition and guidance on therapy which includes the few specific treatments tested in controlled trials in PI-IBS patient to rate the quality of evidence on patient education. The first step in the treatment is to educate patients about the link between intestinal infections and subsequent development of IBS. Statement 2 (Moderate Recommendation) Reassurance should be provided, especially with suspected viral associated PI-IBS, that symptoms are likely to improve or resolve in several patients over time. 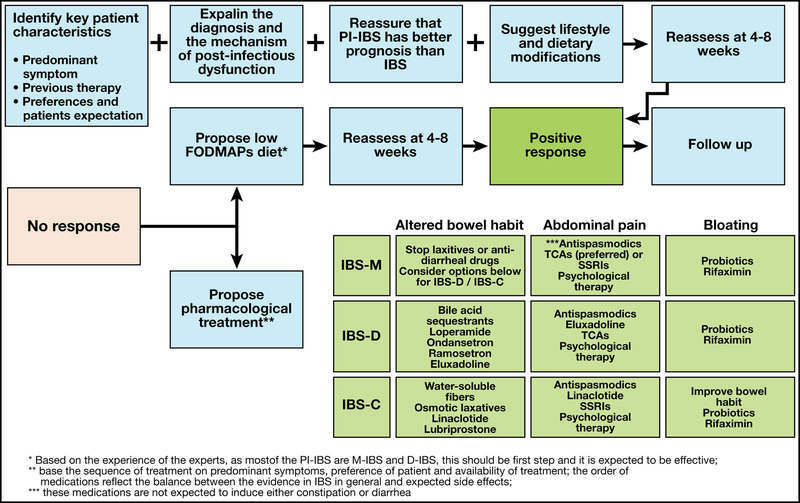 Statement 3 (Moderate Recommendation) There are no specific treatment options for PI-IBS, and treatment should be guided by treatment of IBS in general (depending upon the subtype: IBS-D, IBS-M, or rarely IBS-C). Statement 4 (Statement Rejected) Given the fact that PI-IBS is trigger by infection and microbiota may be linked to symptom development, modulation of microbiota changes with non-absorbable antibiotics, like rifaximin, or a probiotic may be considered as the first choice.